Bitey was with Pablo when he crossed over the rainbow bridge after only a year with us. Pablo’s passing was heartbreaking. There is always a silver lining even to the saddest times, and that was us getting to know Bitey better. 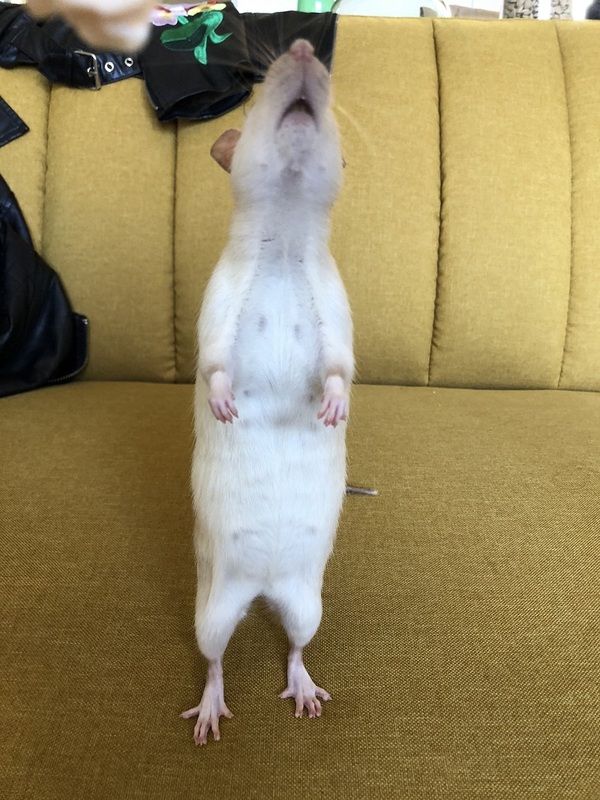 Bitey truly came into his own and became famous at my work, where he was brought on part-time as an office rat but made a full-time impact in giving many of my coworkers their first experience with rats. I more often than not spent ten or more hours of the day with him. He made tons of friends walking around San Francisco on my shoulder, and he became a total fashion icon in his photos. Bitey’s second birthday was coming up and he was doing well, but I got a little too excited. I planned a party for him at my home, as well as one at the office. 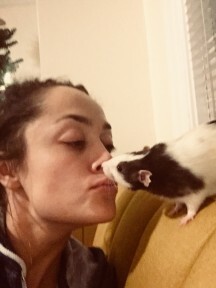 A week before his birthday, I went on vacation to New Mexico with friends and Bitey stayed home with my sister; I kissed him goodbye. A few days into my trip, I got a terrible call. Bitey was very ill and needed to go to the vet. I listened on speakerphone as the vet told my sister that Bitey had a large, inoperable tumor and would need to be put to sleep. I couldn’t deal with the idea of never seeing Bitey again. Thinking of my sister being alone with him during this time was also terrible. I rushed home as quickly as I could, taking an hour-long Lyft to the airport on the first flight out. As hard as I tried, the distance was long, and my flights were delayed. Bitey died an hour before I got home. I had a week to plan and prepare for Pablo’s passing, but this was so sudden. We spent the night with Bitey to say goodbye, and had friends join us in the morning. We had a beautiful funeral together, where we nestled Bitey with flowers and shared cookies with him, a little bite of each kind, just how he liked. We buried Bitey next to his brother; they were together again. The house was emptier than it was before. Soon after, I got a text from a Rattie Ratz volunteer. They were picking up a large number of rats from a shelter in Santa Barbara and needed to make room for them. I usually help Rattie Ratz by writing articles like these, and transporting rats or supplies in my car, the “Ratmobile”, but they asked if I could foster some rats, something I’d never done and was nervous about doing since I was hurting so much. Bitey’s empty cage stared back at me; I decided to go for it. I went to pick up two girls from another volunteer’s house. A black and white Dumbo named Fantasia came right up to me and clung to my chest. Her sister was a cute little Siamese who was also friendly. I fostered them…for about three minutes, after which I adopted them. Lucky for me, they didn’t have an adopter yet. I renamed the Siamese rat Eunice, after a dear friend’s grandmother. The girls get along with Disco and Biscuit. Getting to know them has comforted me greatly in Bitey’s passing. They’re also starting to get famous at the office, although Bitey is a hard act to follow. I’m glad I opened my heart and tried something new by fostering for Rattie Ratz, even though it turns out that I can’t foster cute rats for more than three minutes without crying my eyes out and adopting them. Eunice, a bit more avant-garde. Fashion icon training is going well. 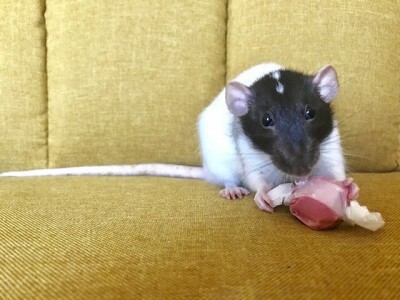 As many of us know, losing a beloved rat is hard. The hole they leave behind is so much bigger than their tiny body. Being able to lean on the wonderful community of volunteers at Rattie Ratz has made all the difference to me and my ratties. There are many reasons to adopt but supporting and being supported by the love and care of this community is one of the best ones. I’m so sorry on your loss of Bitey, Alyssa. No rat lives long enough. In fact, my very first rat, Sigmund Alexander, was my longest-lived at just over three years. But we wouldn’t have our lives any other way. Beautiful article. @ Lori – Indeed, they live such short lifespans It can be very tough but it has taught me a lot. I also have to say that rats know how to play and have a good time. I think they pack in a lot in their tiny lifetimes.